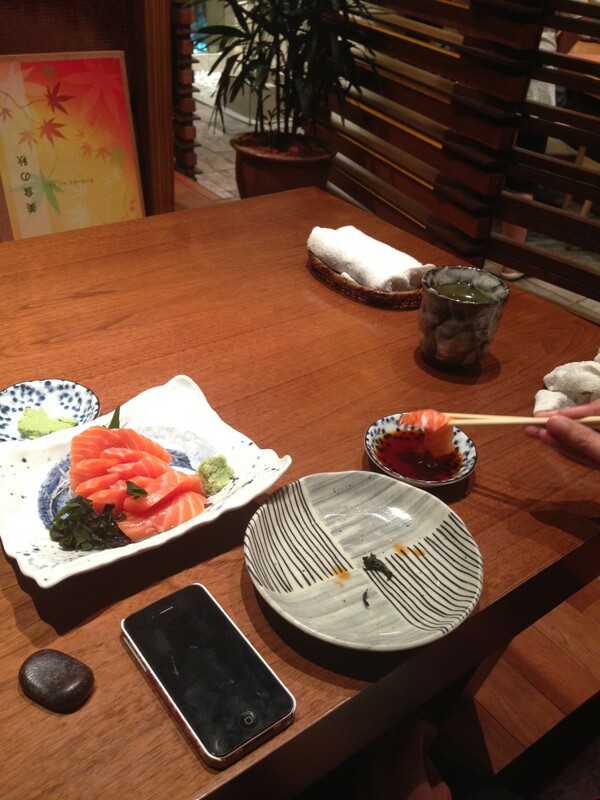 Last evening, hubby and I had our first dinner out with some friends at a Japanese restaurant to celebrate my end of confinement with some well-deserved sashimi. 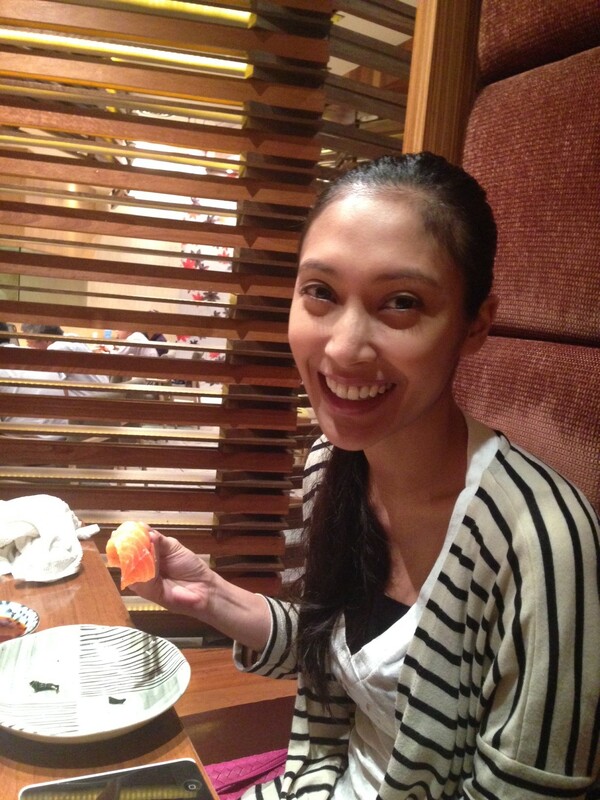 In fact it wasn’t just throughout my confinement that I didn’t eat sashimi-it was throughout my entire pregnancy! So for 11 months I had kept away from one of my fave foods- this definitely calls for a celebration. A few people thought that I was being too paranoid throughout my pregnancy when it came to food- I don’t think I was-it’s just the Virgo in me. I stopped drinking coffee (but I still had lots of tea towards the end) and I didn’t eat raw fish, soft cheeses, soft boiled eggs, mayo and beansprouts for fear of the Listeria bacteria. Apparently listeria infection can occur without you experiencing any symptoms but if the bacteria crosses over into the placenta, it can lead to infections or blood poisoning in the baby and even miscarriage. Research also shows that pregnant women are 10 times more likely to get listeriosis than other healthy adults, so this was a risk that I was just not willing to take (no matter how many people told me it was safe to have the foods I was avoiding). 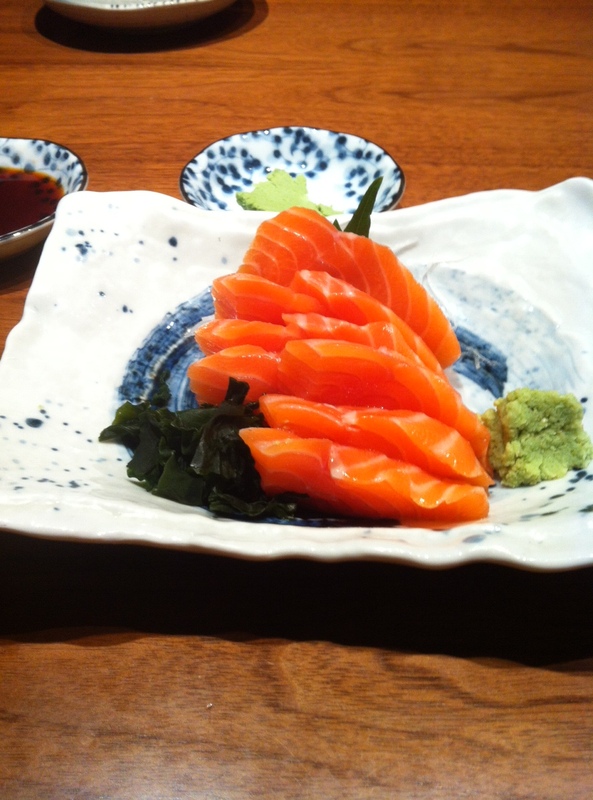 So can you imagine how I felt when this plate of melt-in-your-mouth salmon was placed in front of me? I could almost hear the angels sing.. In between tantrums however, I managed to find this interesting bit of info online. It actually helped to soothe me and definitely makes more sense than my theory of Aidan having psychic abilities ;p. So apparently babies go through something called Mental Leaps which are timed fussiness and occur at specific ages throughout the first 20 months of their lives. Not that I wasn’t panicking inside (I was freaking out ok!) but at least I can now rationalise to myself why he is behaving this way. For 35 years, we have been studying interactions between mothers and babies. We have documented—in objective observations, from personal records, and on videotape—the times at which mothers report their babies to be “difficult.” These difficult periods are usually accompanied by the three C’s: clinginess, crankiness, and crying. We now know that they are the tell-tale signs of a period in which the child makes a major leap forward in his mental development. Babies all undergo these fussy phases at around the same ages. During the first 20 months of a baby’s life, there are ten developmental leaps with their corresponding clingy periods at onset. The clingy periods come at 5, 8, 12, 19, 26, 37, 46, 55, 64 and 75 weeks. The onsets may vary by a week or two, but you can be sure of their occurrence. Aidan is almost at week 8! NOTE: This information is not enough to help your baby through the leap. Read all about this leap in the book and give your baby the help he really needs. This entry was posted in Being a mum, Family, Virgo, WollyLife and tagged Aidan, Amazon, Australia, Baby, Bacteria, Clinginess, Crankiness, Crying, Diyana Abbas, Family, Infant, Infection, Japanese, Listeria, Listeriosis, Mental Leaps, miscarriage, motherhood, Pregnancy, The Wonder Weeks by diyanaabbas. Bookmark the permalink.